Adventurers are people who are as interested in the journey as they are the destination. They have a calling and don’t let anything get in the way of their dreams. Kerry Brinkert, Manager of International Projects and Partnerships, is an adventurer. To mark a “round-number” birthday, Kerry wanted to challenge himself. He had hiked extensively throughout his life and possesses a deep love for the mountains. When thinking of where he would most like to spend his birthday, he knew he wanted it to involve snow and ice. So, of course, he headed to Mexico. Though one usually only thinks about the ice in their beverage when Mexico comes to mind, it is also the home to the third tallest mountain in North America. At 5639 metres, Pico de Orizaba is Mexico’s tallest peak. Though it is a (thankfully dormant) volcano it still has plenty of snow and ice; 9 known glaciers are located on the mountain. Kerry landed in Mexico on June 25th. Staying at the guiding company’s lodge at 2500 metres, he took part in day hikes to acclimatize to the altitude and, having no previous mountaineering experience, to prepare for the main climb. After a few days, they ascended to 4200 metres, staying in a mountain refuge before the big day. At 1:00 am on June 30, Kerry began his climb to the summit. In all, it took about 7 hours – with the last half requiring him to learn to traverse glaciers - his first opportunity to use crampons and ice picks. Though lucky enough not to suffer altitude sickness, Kerry definitely felt the impact of the high altitude. He found himself short of breath. Learning to use the crampons and ice pick while simultaneously gasping for air added another level of challenge to his experience. If that wasn’t enough of a test, Kerry is also afraid of heights and found himself a little bit concerned about the climb back down. Turns out that because they determined Kerry was more than up for the challenge, his guides had taken him up the more challenging route. They took the usual, less steep route, on the way back down. At the summit Kerry was met with some stunning views – and bitter cold. 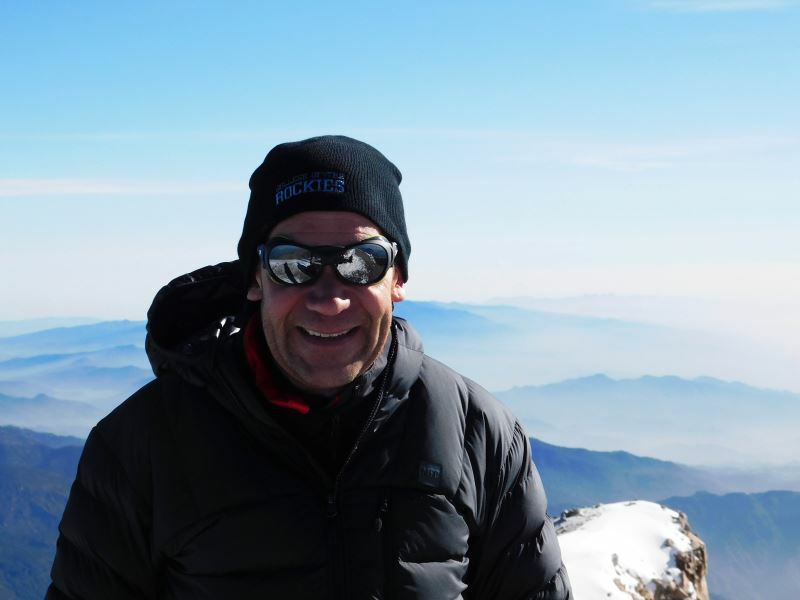 Though he was in Mexico, the temperature was around zero degrees Celsius each night and by the time he got to the top of the mountain, it was more like minus ten degrees, though the wind made it feel much colder. No matter the challenges he encountered, however, it was an experience Kerry will never forget. He was able to succeed at a truly incredible physical challenge and learned new skills and abilities along the way. In fact, it was an experience he hopes to have again. As Kerry’s work often takes him to Kenya and Tanzania, he definitely now has Kilimanjaro and Mt. Kenya (the 1st and 2nd tallest peaks in Africa) on his radar. Kerry, you absolutely fit the definition of adventurer. Congratulations on your amazing climb – and happy belated birthday.